That is, until she meets Benjamin Shaw. 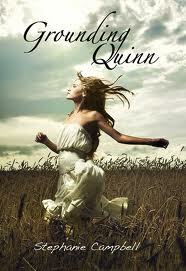 Quinn thinks hooking up with Ben over summer vacation will be nothing more than a quick fling. She can’t even commit to a nail polish choice, much less some guy. Unfortunately for her, Ben is not just some guy. Ben gets her- the real her, flaws and all- and that scares the hell out of her. When Ben does the unthinkable- tells Quinn he’s in love with her- she does what comes naturally. She pushes him away. Ben can only watch from a distance as Quinn lashes out, and punishes him for daring to care about her. But how far can you push someone, even someone who loves you, before they are gone for good? This book was a lot heavier than I thought it would be. Quinn's family is dysfunction all around. But, who's family doesn't have a little bit of dysfunction? I know mine does! Quinn takes it to another level though. She thinks because her family isn't perfect and she has many problems, that she isn't worth loving. That made my heart hurt. We all are worthy of love. No matter how much of a screw up we are (or our family). I liked it. It hit home for me in many ways though. Brought feelings up from my past that I was sure were buried deep, but weren't. Actually shook me a bit. I wanted more of a resolve at the ending, but I like everything packaged up in a neat little bow. This story isn't like that. Ben is my favorite character, he's a rock. Everybody needs a rock in their life. This is a heavy story, but a good one! "I have no clue what my motive is for following him, maybe I'm just bored. Maybe it's just so easy to cyber-stalk hotties on Facebook that I've moved on to doing it in real life." Oh, love the sound of this one! The same thing has happened to me in the past, too: a book ends up being a lot darker & heavier than I was expecting. @Emidy I totally wasn't expecting something so heavy, but I really enjoyed it!